What does a cities musical DNA look like? We looked at Manchester, UK to find out…. During our time building and developing ‘Constellation’ — our tool for tracking audiences preferences for entertainment we’ve played around with a few potential uses for it and in fact feel like we’re uncovering more and more every day. 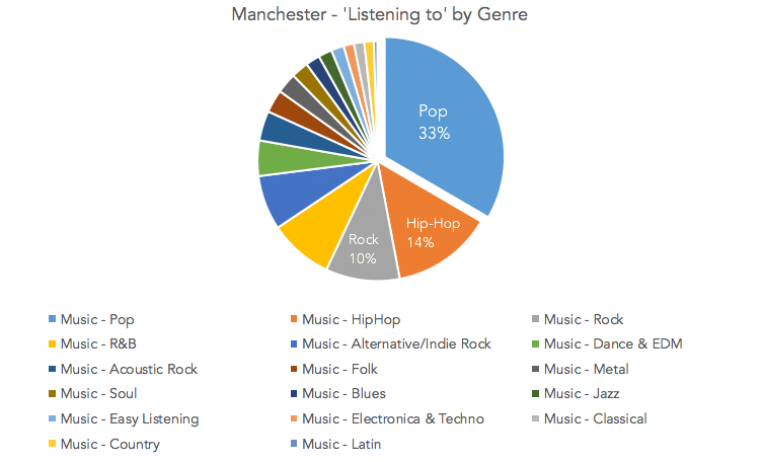 One useful discovery was that we could use our ever growing database of music acts and artists to better understand audience listening habits as shared via social media — and so we thought we’d spend some time looking at city which we know and love, Manchester. Oh and if you’re wondering — this is based on social media data from January 2015 through to May 2016. 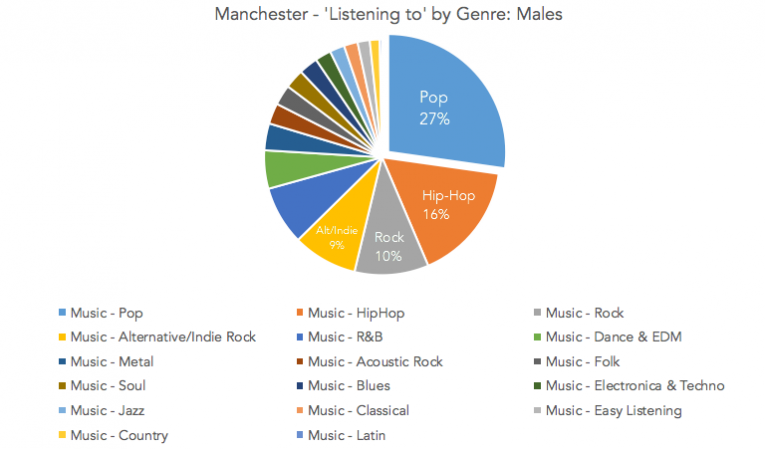 Firstly we grouped the artists that Manchester music fans were talking about listening to up into genres and discovered that Pop Music saw exactly a third of overall conversation — although this isn’t surprising as in our experience this is the genre that is talked about the most worldwide due to its widespread popularity. Interestingly Hip-Hop (14%) saw the second largest share and Rock (10%) the third, with Alternative/Indie (for which the city is well known) seeing a 7% share. 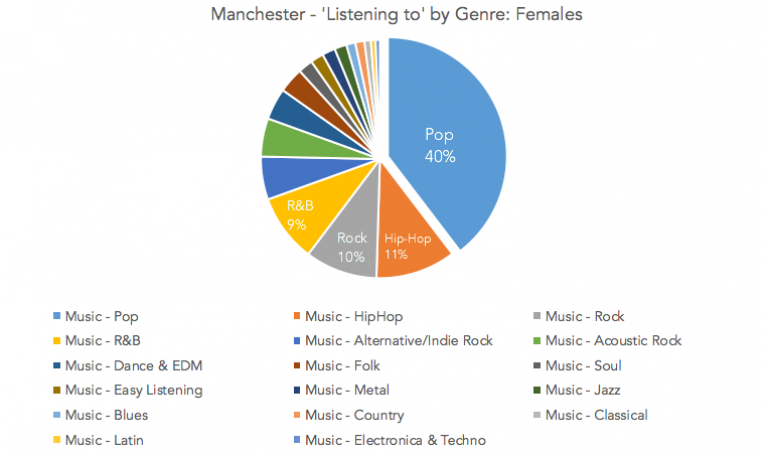 As you can see the share of Pop music conversation is less than the overall here — and both Hip-Hop and Alternative/Indie see a larger share too, suggesting that in Manchester at least these two are slightly more ‘Male’ genres. When we look at the data from female audiences the share talking about listening to Pop music jumps up fairly dramatically to 40% — and although Rock and Hip-Hop keep the second and third largest shares. it is R&B and not Alt/Indie that takes fourth place here. With Pop music seeing the largest share of conversation we wanted to take a look at the individual artists from this genre first to see what is driving this. 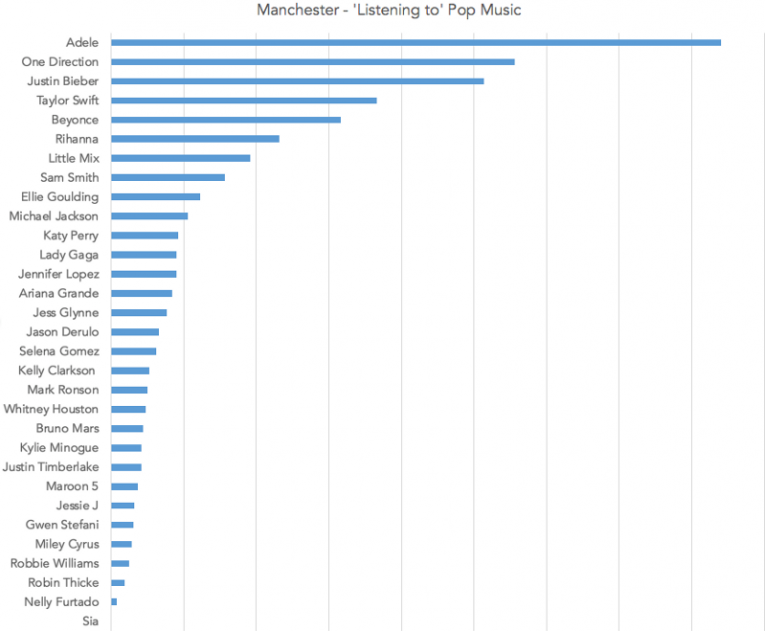 As the graph above shows, Adele is clearly as massively popular in Manchester as she is elsewhere — seeing a much more prominent share of conversation than other artists. Unsurprisingly given their mass popularity, One Direction and Justin Bieber also see large shares here — although Taylor Swift less than we’ve seen in global audiences. 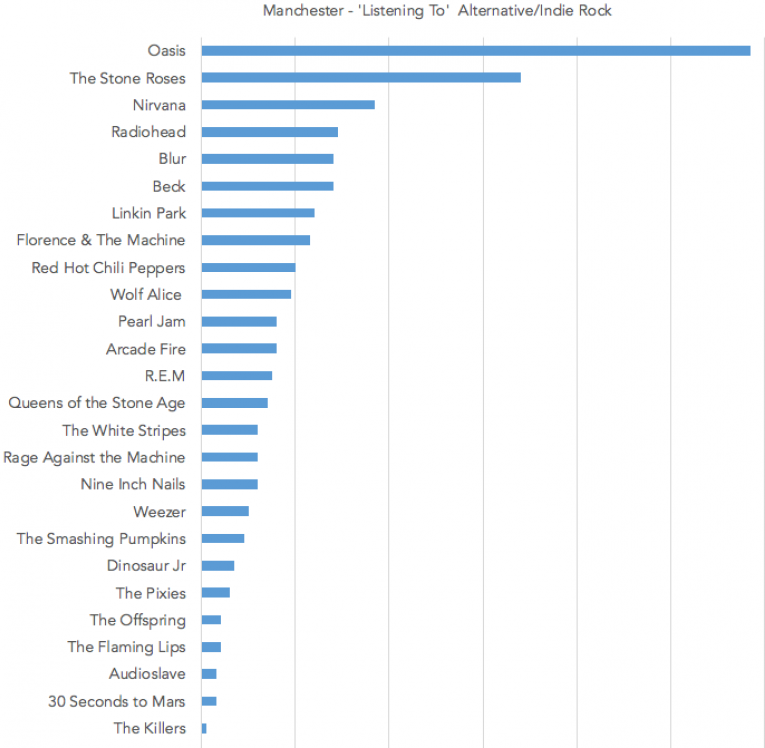 Finally, we wanted to take a look at the ‘Alternative/Indie’ genre that many people would associate with Manchester to see the artists most talked about. 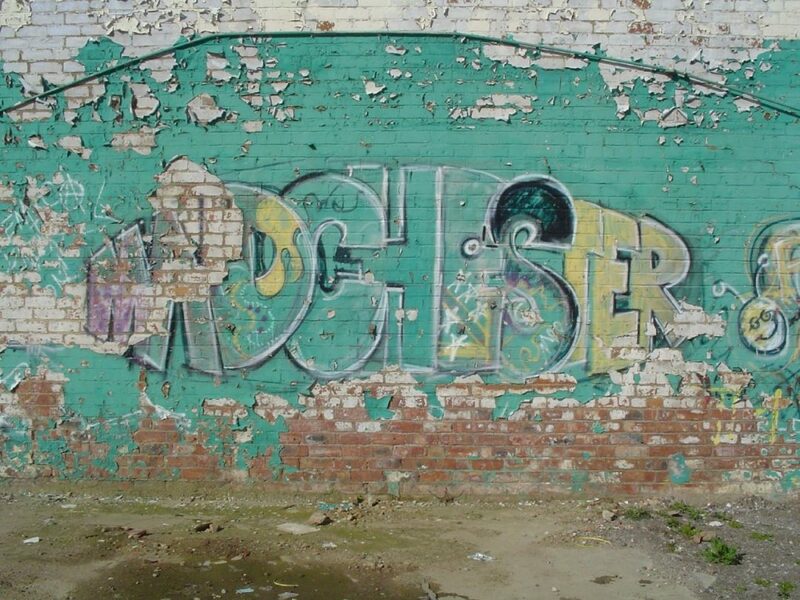 As one time residents of Manchester we weren’t that surprised to see the field was led by quite a degree by Oasis, who are still loved by the cities music fans and The Stone Roses, who have recently released a new single after a 21 year hiatus. And interestingly, whilst back in 1995 at the height of Britpop and the bands rivaly with Oasis it would have been unlikely that a Mancunian would admit to listening to Blur it seems these days it is a least a little bit more acceptable.